serological analysis of inbred and wild mouse strains (reviewed in reference 2). (H-2d haplotype) has 8 (reviewed in reference 3). cells transfected with these genes, but were detected only in whole cell lysates . changed to be consistent with that of B10 (5). activated T cells synthesize a secreted form of Qa-2, in addition to the membranebound form, has added even more confusion to the issue . .1 cells, but not on L cells . We have mapped the tissuespecific element downstream of a site near the middle of Q7 b exon 4 by exchanging segments of Q7b and H-2D 6 . England Biolabs, Beverly, MA), and were purified by chromatography on Sephadex G50 . Cate et al . (16), using Gene Screen nylon 66 membranes (New England Nuclear) . 45В°C, and at high stringency in 3 .2 M tetramethylammonium chloride (TMACL) containing 1% SDS, according to Cate et al . (16) and Wood et al . (17) . and Gilbert (18) wash buffer at 70В°C. Moloney murine leukemia virus ; PSB, plaque screen buffer ; TMACL, tetramethylammonium chloride . constructs. The Q7 b exons and 3' untranslated region (3'UT) are indicated by open boxes ; H2Db exons and 3'UT by closed boxes ; introns, 5', and 3' flanking sequences by solid lines . 3' cassette is indicated by an open box broken by a line representing the 64-bp intron . Restriction sites: B, Bam HI ; N, Not 1 ; RI, Eco RI ; U, Stu I .
similar 2 .75-kb fragment of Db Mo, by using the Stu I site present in exon 4 of both genes . are illustrated in Fig . 1 . Grand Island, NY) . Growth medium was DME for L cells, and RPMI 1640 for R1 .1 cells . 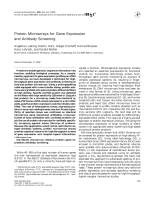 of surface protein by binding of mAbs D3 .262 (28), 20-8-4 (29, 30), and B22 .249 (31) . to detect bound antibodies . cells using the lithium chloride method of Auffray and Rougeon (32), as modified by J .
Bertonis and W . Schleuning (unpublished results) . RNAs were denatured and electrophoresed through formaldehyde/1% agarose gels (20 Ag/lane), transferred to nylon membranes, and hybridized to s2 P-labeled oligonucleotides, as described by Cate et al . (16) .
' Based on the published sequences of H-2Kb (15), H-2Db (33), Q7b and Q8 b (11) . temperature that would melt off the probe if it contained more than one basepair mismatch (17) . At low stringency, this probe reacts with nearly every class 1 sequence. I Not tested against genomic cosmid clones since these probes recognize spliced exons. Isolation of a Full-Length Q7b cDNA from CTL Clone 2.1.1 .
previously (14), the cloned alloreactive BALB.B10 CTL line 2.1 .1 (H-2 b haplotype) expresses only a 36,500 mol wt form of Qa-2 protein on its cell surface. class I genes. A total of 42 cDNA clones were isolated . that would detect any other Qa region gene. number line . Positions of the two potential asparagine-linked glycosylation sites are overlined. the exon 7 splice acceptor signal of Q7b appears to be defective (11). uncloned G418-resistant populations (data not shown). exon I and the M-MuLV LTR, a strong enhancer and promoter (see Fig. 1). and mAb 20-8-4 . Neither of these constructs, however, expressed detectable Qa2 on the surface of L cells (Table II). Thus, the tissue-specific expression of cellsurface Qa-2 is not overcome by use of the M-MuLV LTR. parentheses . R1 .1 and Ltk- are the untransfected parent cell populations . samples, and the variation in all cases was not >10% . element in the 3' part of Q7d prevented its cell-surface expression . difference is localized to the COOH-terminal half of the a3 domain. indicated by a single arrow; the 1 .2-kb band by two arrows . maps downstream of the Stu I site in exon 4.
levels are presented in Fig. 3.
on the autoradiogram . In spite of this quantitative difference, the R 1 .1 transfectant, but not the L cell transfectant, expresses cell-surface Qa-2 (Table II). spliced this way, and not because they are truncated (data not shown) . cells may account for the tissue-specific expression of Qa-2 antigen. 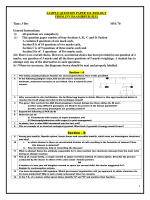 2.1 .1 is the product of the Q7b gene based on the following lines of evidence . both R 1 .1 and L cells. expression of cell-surface Qa-2 may be regulated at the level of RNA processing . required coexpression of these molecules (discussed in references 39-41) . RNA and protein. Current experiments in our laboratory are directed at understanding the basis for our observations . may play a role in the tissue-specific expression of Qa-2 . Cate, Karen Fahrner, John Fraser, Kuzhalmannam Ramachandran, and Richard Tizard . We appreciate the technical assistance of Joann Jablonski and Leslie Wachter . 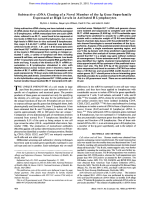 Received for publication 1 December 1986.
antigen expression on functional lymphoid, myeloid, and stem cells in adult mice . J. Complex in Immunology . M . Dorf, editor . Garland STPM Press, New York . 33-57 . 3 . Flavell, R . A ., H . Allen, L . C . Burkly, D . H . Sherman, G . L . Waneck, and G. Widera . 1986 . Molecular biology of the H-2 complex Science (Wash. DC) . 233 :437 . L . Hood . 1982 . Identification of the class I genes of the mouse major histocompatibility complex by DNA-mediated gene transfer . Nature (Lond .) . 300 :231 .
mouse major histocompatibility complex . J. Exp . Med . 163 :1227 .
genes encoding murine Qa-2 class I antigens . Proc . Natl . Acad. Sci. USA . 82 :5920 . 7 . Stroynowski, I ., J . Forman, R . S . Goodenow, S . G . Schiffer, M . McMillan, S . O .
histocompatibility complex and carboxyl termini of transplantation antigens . J. Exp . Med . 161 :935 .
class I genes of the major histocompatibility complex in mouse L cells . Proc. Natl . Acad. Sci . USA . 82 :6245 .
domains . Cell . 25 :683 . 10. Weiss, E. H., L. Golden, K. Fahrner, A. L. Mellor, J. J. Devlin, H. Bullman, H.
(Lond. ). 310 :650 .
complex : a comparison . EMBO (Eur. Mol. Biol. Organ.)J. 4:3203 . 12 . Mellor, A. L., E. H. Weiss, M. Kress, G. Jay, and R. A. Flavell . 1984. A nonpolymorphic class I gene in the murine major histocompatibility complex . Cell . 36:139.
biosynthesis and secretion of Qa-2 molecules in activated T cells . Proc. Natl. Acad. diverse Qa-2-encoded molecules on the surface of cloned cytotoxic T lymphocytes. J. Exp. Med. 160 :1421 . 15 . Weiss, E., L. Golden, R. Zakut, A. Mellor, K. Fahrner, S. Kvist, and R. A. Flavell . (Eur. Mol. Biol . Organ.) J. 2 :453. 16. 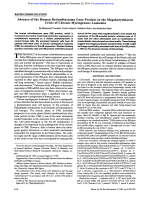 Cate, R. L., R. J. Mattaliano, C. Hession, R. Tizard, N. M . Farber, A. Cheung, E. G.
Mullerian inhibiting substance and expression of the human gene in animal cells . 17 . Wood, W. I., J. Gitschier, L. A. Lasky, and R. M. Lawn. 1985 . Base compositionindependent hybridization in tetramethylammonium chloride: a method for oligonucleotide screening of highly complex gene libraries . Proc. Natl. Acad . Sci. USA. 18 . Church, G. M., and W. Gilbert. 1984. Genomic sequencing. Proc. Nad. Acad. Sci. chemical cleavages . Methods Enzymol. 65 :499.
for DNA sequencing. Nucleic Acids Res. 8:4613 . 22 . Grosveld, F. G., Lund, T., E. J. Murray, A. L. Mellor, H . H. M. Dahl, and R. A.
eukaryotic cells . Nucleic Acids Res. 10:6715 . H-2D6 or of a truncated H-2D6. Proc. Natl . Acad. Sci. USA. 83 :7447 . Manual . Cold Spring Harbor Laboratory, Cold Spring Harbor, New York. 545 pp. .
25 . Wigler, M., A. Pellicer, S. Silverstein, R. Axel, G. Urlaub, and L. Chasin. 1979. DNA-mediated transfer of the adenine phosphoribosyltransferase locus into mammalian cells . Proc. Natl . Acad . Sci. USA. 76:1373 . K immunoglobulin genes introduced into mouse pre-B lymphocytes by electroporation . Proc. Natl . Acad . Sci . USA . 81 :7161 . CFU-s . J. Immunol . 129 :928 . 29 . Ozato, K., and D . H . Sachs . 1981 . Monoclona l antibodies to mouse MHC antigens . control of isotype expression . J. Immunol . 126 :317 .
monoclonal antibodies . J. Exp . Med. 159 :21 .
complex and by the Qa/TL region in mice . Immunol . Rev. 47 :175 . 32 . Auffray, C ., and F . Rougeon . 1980 . Purification of mouse immunoglobulin heavychain messenger RNAs from total myeloma tumor RNA. Eur. J. Biochem . 107 :303 .
of the murine transplantation antigen H-2D6 as deduced by molecular cloning . Immunogenetics . 16 :1 . 34 . Klein, J ., and F . Figueroa. 1986 . The evolution of class I MHC genes . Immunol . evolutionary relationships among major histocompatibility complex class I genes . Proc. Nad . Acad . Sci . USA . 82 :5860 .
sequences are transcribed in the early stages of mouse embryogenesis . EMBO (Eur . Mol . Biol. Organ .) J . 4 :1749 .
in embryonic and adult mice . EMBO (Eur . Mol . Biol . Organ .) J. In press . H-2 protein lacking a cytoplasmic tail . J . Cell Biol . 102 :1 . 39 . Hedrick, S . M ., E . A . Nielsen, J . Kavaler, D . I . Cohen, and M . M . Davis . 1984 . Sequenc e relationships between putative T-cell receptor polypeptides and immunoglobulins . Nature (Lond .) . 308 :153 .
of human T-cell receptor complex . Nature (Lond .) . 312 :413 . 41 . Sim, G . K ., J . Yague, J . Nelson, P . Marrack, E . Palmer, A . Augustin, and J . Kappler . 1984 . Primary structure of human T-cell receptor a-chain . Nature (Loud.) . 312 :771 .